Gego (born Gertrud Goldschmidt) studied engineering and architecture at the Technische Hochschule in Stuttgart, Germany. She arrived in Venezuela in 1939 and worked as an industrial designer and architect until, between 1953 and 1955, she and her companion, Gerd Leufert, moved to Tarma, where she began her artistic career. Gego started producing collages and expressionist landscapes, but soon intrigued by the priority of the line as structural base she took up drawing in ink, working in the style of constructivist abstraction. 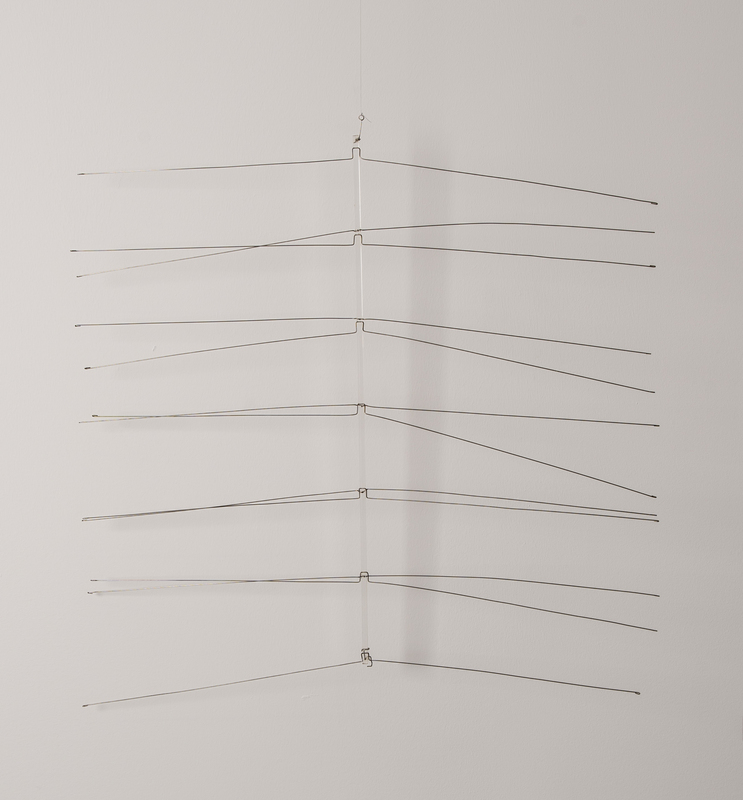 Around 1957, Gego created sculptures in metal and drawings in which she combined diverse planes constructed from parallel lines after which she named the series. The layering of contrasting these planes produced effects of vibration that associate Gego’s work with kinetic art. This language was also present in Estructura, a work of for an architectural seeting that she produced for the Banco Industrial de Venezuela (Caracas, 1962), and in her engravings, a medium she mastered while visiting Iowa State University (1959) and the Tamarind Lithography Workshop in Los Angeles (1966). Towards the mid 1960s, the linear planes of her works were altered by lines that interrupted themselves, becoming independent and changing directions. These works were awarded the Premio Nacional de Dibujo in Venezuela (1968). In 1969, Gego used lines intersecting in triangular forms to produce complex systems of meshes or networks, which she named Reticuláreas and that became her emblematic works. On paper, these webs covered all the ground with variations of density and depth. In the same year she installed a great Reticulárea at the Museo de Bellas Artes de Caracas and at the Center for American Relations in New York. Over time, the form of the Reticuláreas became squares and their structures became more complex. During the first half of the 1970s, she developed new series separated from the Reticuláreas, including Chorros (1970), Troncos (1974), and Esferas (1975), among others. In 1976, she began working on her Dibujos sin papel, in which lines “are drawn up” in space by means of wires. These were intimate works of small or medium format, of minimal structure that acquired density through the incorporation of meshes, rods, and small metallic objects. In 1979, she received the Premio Nacional de Artes Plásticas. During her last stage, Gego developed two series that continued with the use of the previous intimate line: Los bichos (1986) and Tejeduras (1988). 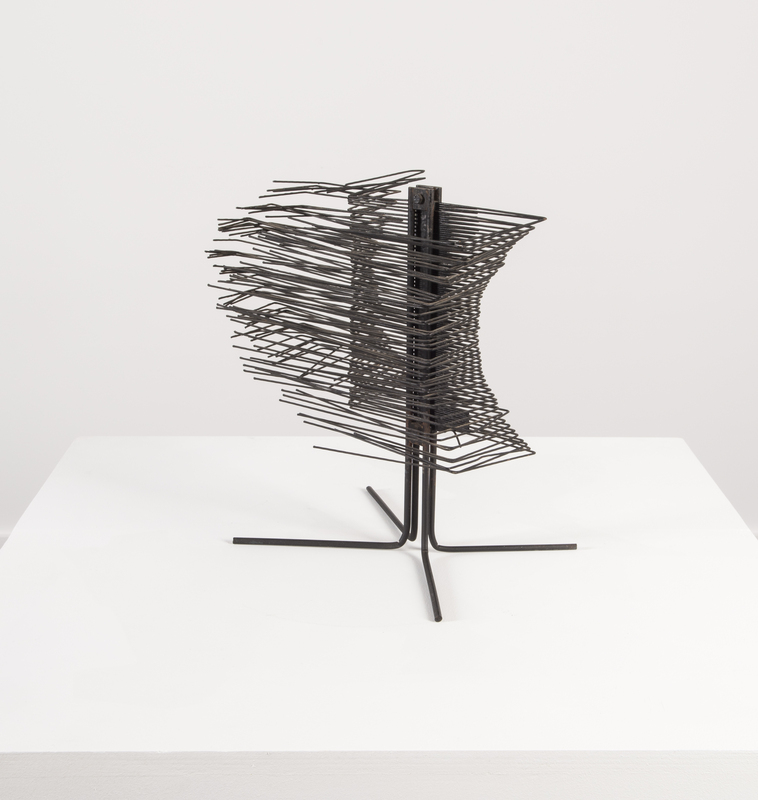 The first series were small sculptures of wire with a kind of humor, while Tejeduras were strips of paper (sometimes trimmed from magazines or cigarette boxes) interlaced and adhered to a flat support. In spite of their differences, many pieces of both series have the same origin, the reusability of previous work that Gego undid or trimmed so that they served as raw material and substrate to the new ones. 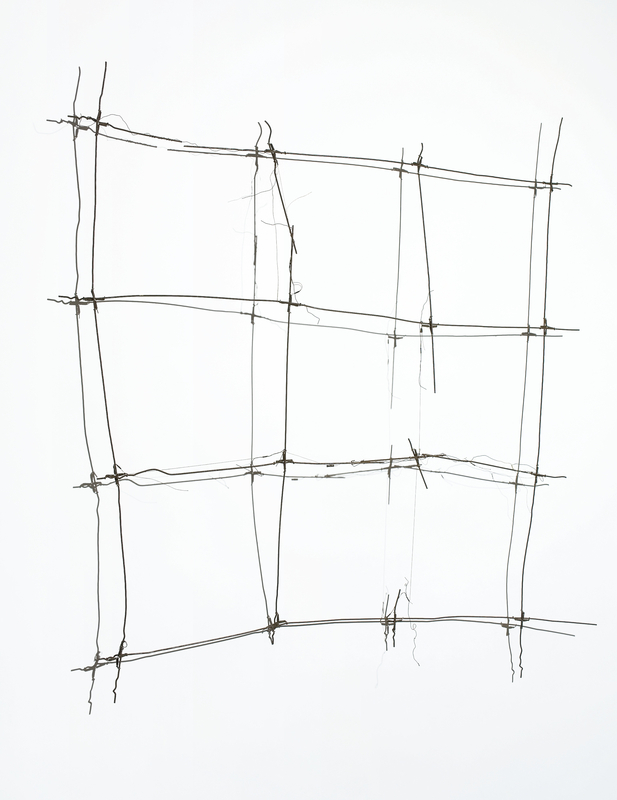 Posthumously, Gego has received international recognition with exhibitions such as Questioning the Line: Gego 1955-1990. A Selection and Gego: Between Transparency and the invisible (both in the Museum of Fine Arts, Houston, Texas, United States, 2002 and 2005, respectively), as well as Gego: Desafiando estructuras (Museu d’ Art Contemporani in Barcelona, Spain, 2006), among others. In 2012, in celebration of the centennial anniversary of her birth, the following exhibitions took place: Gego: Colección Mercantil (Espacio Mercantil, Caracas), Procedencia y encuentro (Sala Mendoza, Caracas), Gego. Obra Abierta. Testimonios y vigencia (Museo de Arte Contemporáneo de Caracas) and Gego: Origin and Encounter, Mastering the Space (Americas Society’s Art Gallery, New York).